Well, here it is: the How To Draft A Sloper post! It's er... very long. Thought I should warn you. Pardon me if I sound didactic and not my usual silly self in this tutorial. There are so many technical terms and so much information to introduce that I'm choosing to be concise and not meander off into Lalaland like I sometimes do. A reminder before we start: do not copy any part of this tutorial onto your site - link back to it and, if you like, use one or two photos. If you'd like to translate it in its entirety, please email me first. 1 The sloper we will draft is for half the front body and it assumes the body is vertically symmetrical (left and right sides are the same). If you are familiar with commercial patterns, you will find that it looks very similar. Because it is half of the front body, we will be halving any measurement taken across the entire body (left+right sides). 2 We will be drawing some horizontal and vertical reference lines to help us plot the important measurement points accurately on the paper. These lines will be in green and will not be actual seam lines. 3 As each new point/line is introduced, it will be drawn in red so that it stands out. The sketch that shows how to obtain the corresponding measurement will also show that measurement in red. I will draw over it in black on the draft when the next new (red) point/line is introduced. 4 Some measurements are extras, and they are taken to check the accuracy of other measurements. We don't actually plot these. However, it is useful to know how to obtain these measurements - in the sketches, these measurements will be in blue. 5 The actual, final edge lines of the sloper (what/where you eventually sew or fold) will be in black. 6 Each new point/line that is plotted will be accompanied by a sketch that shows how to obtain that measurement on the body. It will also include a reference number (e.g. #4) that corresponds to the now-revised Measurement Table Worksheet. As I mentioned in the earlier overview post, this is not what happens in reality. Usually, all the measurements are taken and recorded in one sitting, after which the sloper is then drafted. I take my measurements to the nearest eighth of an inch. 7 I will also share actual numerical values from my own measurement of one of my children. Like a worked example of sorts. I thought about including these values in the sketches and draft themselves, but decided against it. Two reasons - one, they will distract you, and two, they will distract you. (i) to draw your attention to the point or line we are talking about, especially when the draft begins to fill up with more and more lines and points. (ii) (where relevant) to show the direction in which the measurement was taken, or the line was drawn, or the point was plotted. 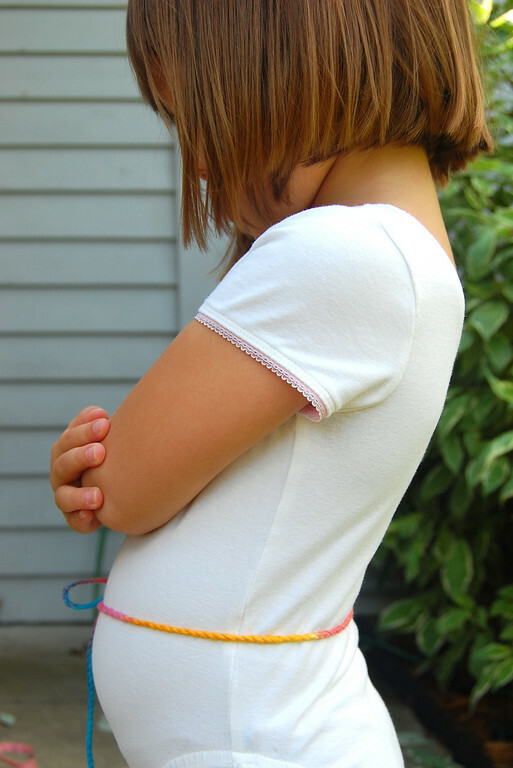 1 Locate the Waist of the child and tie the twill tape/string around it snugly enough that it does not shift vertically. Children do not have nipped-in waists so it easiest to locate it by looking from the side. See the curve of the back? Where it is most hollow/concave is the waist. 2 Drape the chain/string around the back of the neck so that it hangs down on both sides of the neck and goes around the base of the neck (where the neck joins the shoulders). Locate the little hollow in front of the neck where the throat is. This will later be referred to as the Hollow Of Neck. Mark this point with a sticker or marker. 3 Mark (or use a sticker - mine is the little pink heart) the position of the Side/Base of Neck. It should be midway between the front and back of the body. This point is ideally where the neck meets the shoulders at the intersection of a (imaginary) shoulder seam. 4 Locate the Shoulder Point. This is where the arm joins the shoulder and also lies along the (imaginary) shoulder seam. It may help to raise and lower the arm to locate this joint. 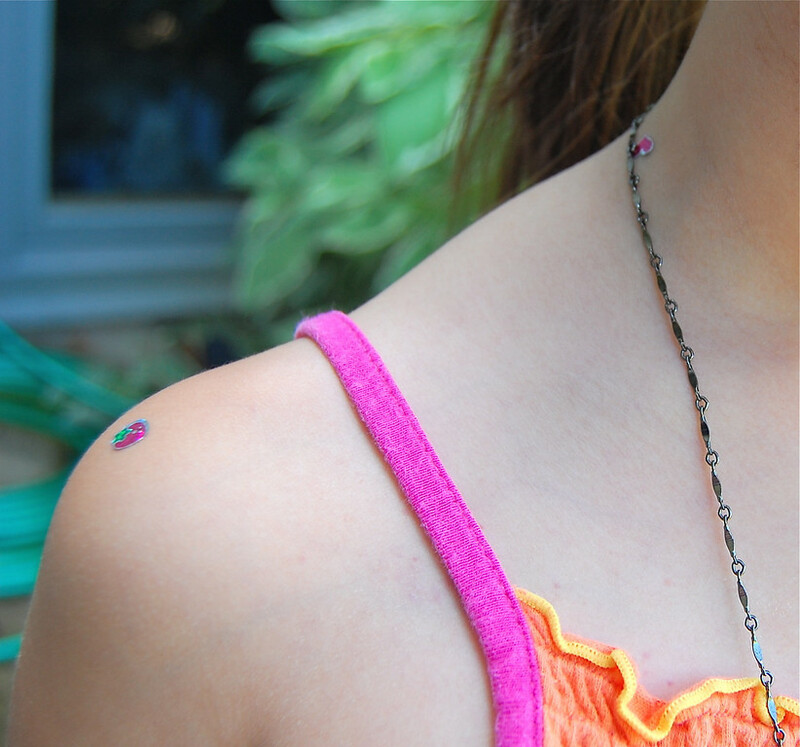 Mark this point (on both shoulders) with stickers or marker. 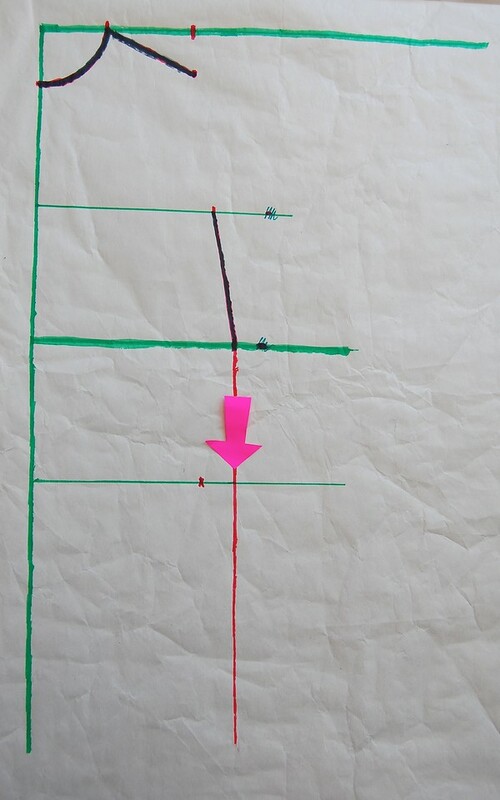 Draw a long vertical line close to the left side of the paper. This represents the Center Front Line that divides the body in half. Square and draw (i.e. 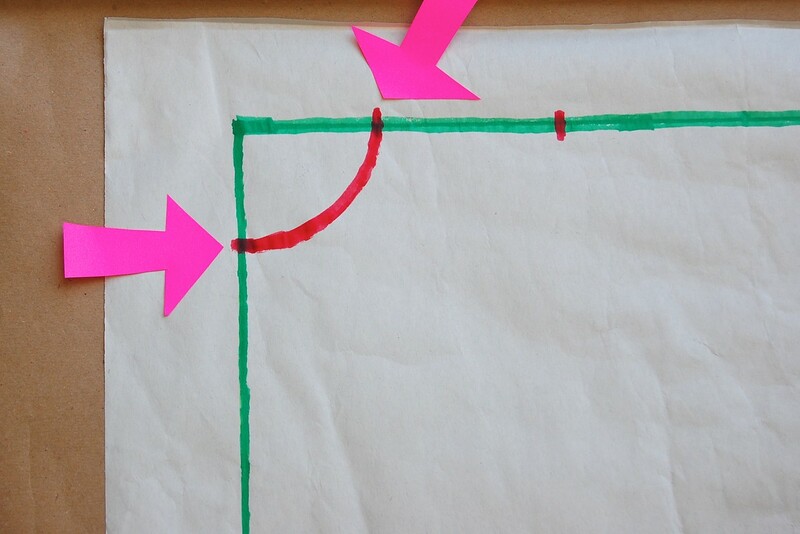 make perpendicular) a horizontal line close to the top of the paper. This is the Shoulder Line. This represents the level of the body's highest point that will be plotted - this point is the Side/Base of Neck. Measure the vertical distance (#1) between the Side/Base of Neck and the Waist. Plot this distance vertically (red dot) below the Shoulder Line. Mine was 10 3/8". Draw a horizontal line (any length) through this point. This is the Waist Line. Measure the vertical distance (#2) between the Hollow of the Neck and the Waist. You will be measuring this along the Center Front Line of the body (since that's where the hollow is). Plot this point (red dot) upwards from the Waist Line, along that vertical Center Front Line (because, as earlier mentioned, that's where the hollow is) you drew in Step 1. Mine was 8.5". Measure the horizontal distance (#3) between the two Shoulder Points. This spans both halves of the body so we need to divide this by two and plot the half value. Mine was 10" between Shoulder Points, and the half value was 5". 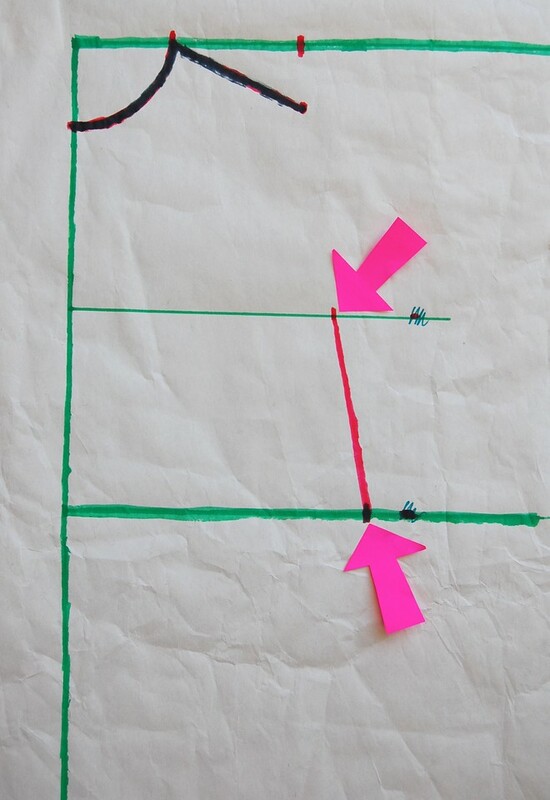 Plot this horizontal distance (red dot) from the Center Front Line, along the Shoulder Line. Q: But the shoulder point is not on the same level as that Side/Base of Neck thingy! Why are we plotting it on the same green horizontal line?????!!!!! Nobody apart from robots has shoulders THAT square! A: Relax. This is just the horizontal distance between them, like an x-coordinate. We'll twiddle with it a little more in a later step. On one side of the body (you get to pick! 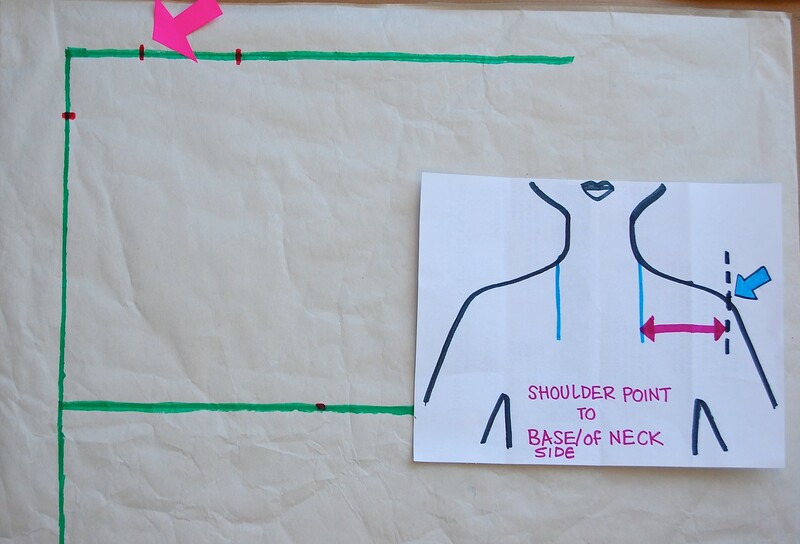 ), measure the horizontal distance (#4) between the Shoulder Point and the Side/Base of Neck. Plot it along the Shoulder Line too, but backwards/leftwards from the Shoulder Point towards the Center Front Line (see pink arrow). Mine was 2 7/8". Rambling aside: regular readers of this blog might remember that when mum measured me for my sloper in March, she said that one of my shoulders was wider than the other, by about 1/4". This Shoulder-Point-To-Side/Base-of-Neck was the measurement that revealed this sad anatomical anomaly I'd apparently always had. We blamed it on all the one-handed sports I used to do, not that I was even any good at them. I mention this here not to scare you silly at this early stage in our drafting adventure, but to explain this concept: plotting half the body assumes that the body is symmetrical. This works for most people, especially children. However, if you are drafting for older people, sometimes you might have to draft different left and right slopers. For what sorts of cases, you might ask? Think professional bowlers, softball pitchers, some other sportsfolks who have significantly more developed shoulder muscles in one arm than the other, people with certain disabilities, just to suggest a few. But for most regular people, it's OK to overlook even a slight imbalance and sew symmetrical clothes. Here we pause to do a check. Measure the horizontal distance (#5) between the Side/Base of Neck points on either side of the neck. This is the Width of Neck. The chain/string draped around the neck should help you with this. Again, this measurement spans both left and right sides of the body, so we will use the half-value. Mine was 4 1/4", and the half-value was 2 1/8". 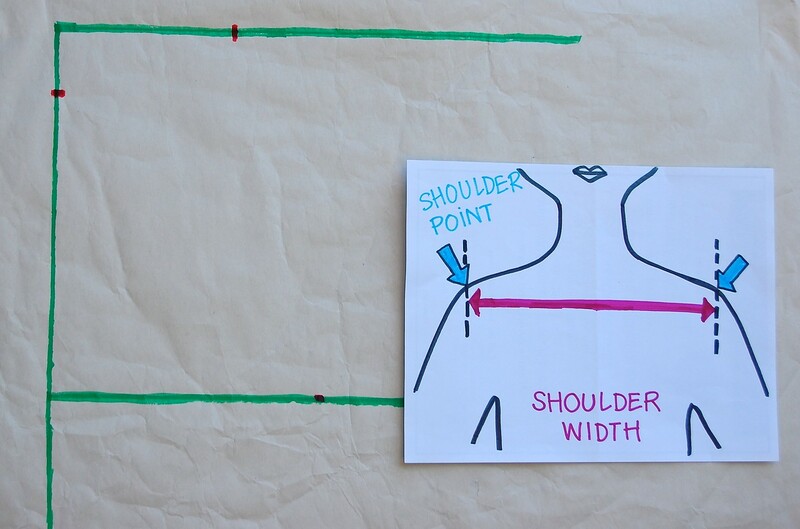 Check this measurement against the Width of Neck distance on your draft, along the Shoulder Line. It should be the same, give or take 1/8". If not, check your measurements for the earlier steps. We finally get to draw a real seam line! But, darn it, it's a curve. 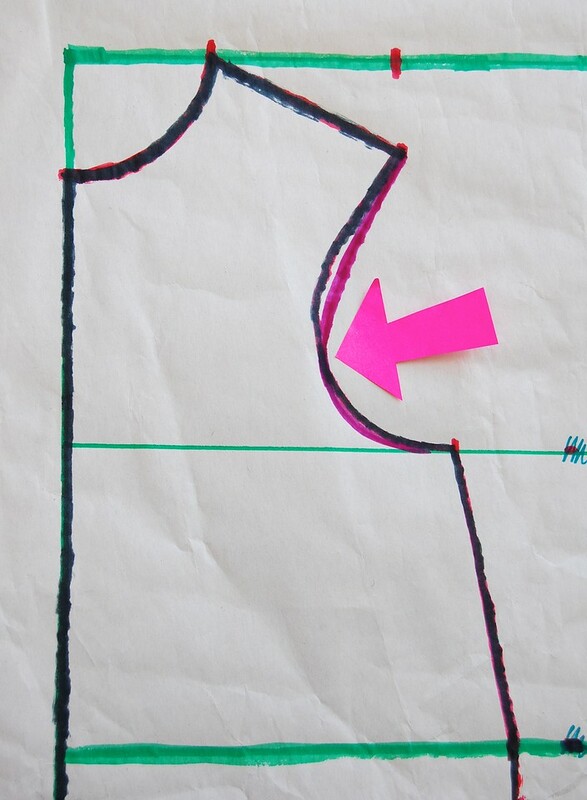 The pink arrows show the two points between which to draw the front neckline. Use a curve-drawing aid if you need to. I sketch mine free-hand. Now we will plot the Shoulder Slope i.e. we need to measure how slope-y the shoulders are. Measure the vertical distance (#7) from the Shoulder Point to the Waist. Shoulders are rounded, rather than flat like a wall. Your measuring tape is vertical along the chest but will need to curve a little over the top of the shoulder to get to the shoulder point. Do that - it's correct. If your child's shoulders are particularly wide horizontally so that there is no Waist directly under the Shoulder Point (like in my sketch), estimate the level of the waist directly under it, as best you can. Plot this distance on the sketch upwards from the Waist Line and directly under that Shoulder Point point you plotted (and panicked about) in Step 5. Mine was 9". Here we will do another check. 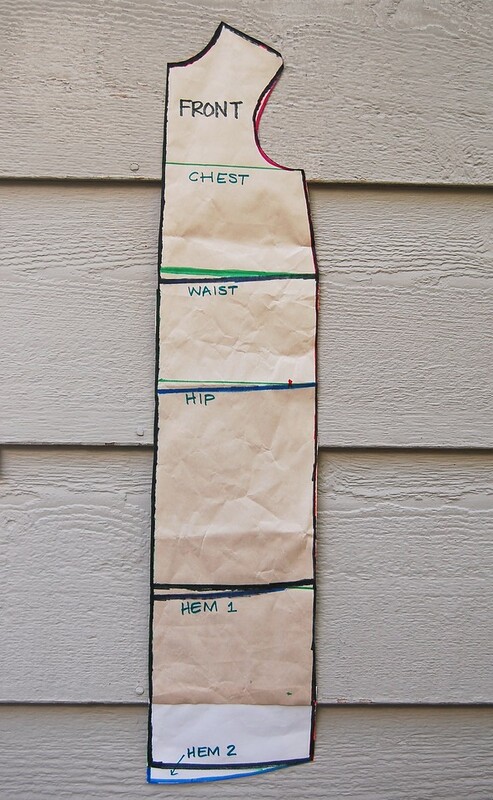 We will take a fancy diagonal measurement (#8) from that Shoulder Point to the where the Waist intersects the Center Front Line (find it on your child on the twill tape/string and directly above the bellybutton). Mine was 10 1/8". Now measure that diagonal distance between the same points on your draft - it should be the same, give or take about 1/8". Did it match? If not, check your measurement in Step 9. Q: What's with all these checks? A: The neck/shoulder/armscye areas are probably the most important to a good fit in any pattern, and must be accurately drafted. These checks will help ensure the measurements were accurate. We get to draw another seam line! Whoo! 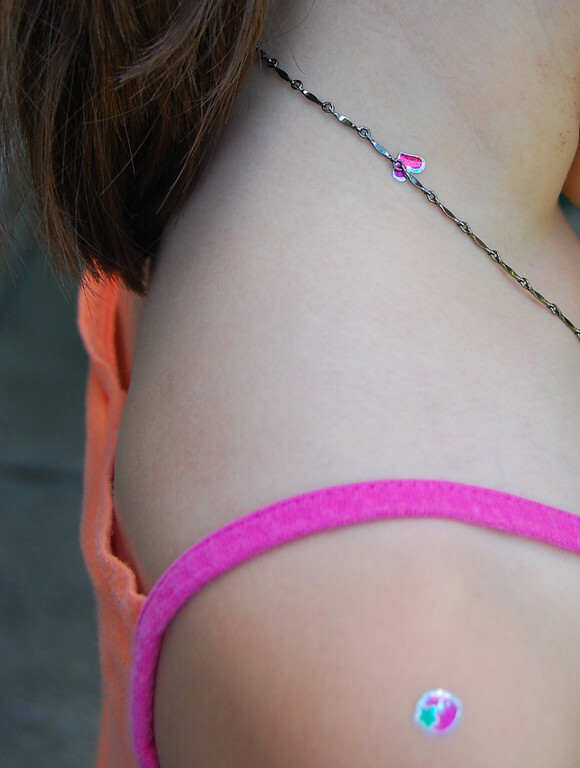 Just join the Side/Base of Neck point to the Shoulder Point in a straight line. Easy. This is the Shoulder Slope. Is it more slopey than you thought it would be? Ah, that's because it is actually going to fit your child. We seem to have been stuck at that Shoulder Line a long time, and now we're finally moving downwards, hurrah. Measure around the Chest of your child. To do this, wrap the measuring tape around the chest as high up in the armpit as it will go. I usually have the child raise their arms, wrap the measuring tape around, then drop their arms and breathe in so the chest expands. Starting with a snug fit, I let the expanding chest enlarge the measurement until I can shift the measuring tape from side to side easily without also falling down to the waist. This is the Chest Measurement + ease (#9). When the child breathes out again, the tape will be much looser, and you will see the effect of the ease you already included when he/she inhaled. Do not add any more ease to this, and record this final value. Mine was 23.5". Most children have symmetrical chests front-and-back (assuming they have not reached puberty and have no need for bras) so we will simply divide this measurement by 4 and use this quarter value for both the front and back slopers. My quarter value was 5 7/8". While you still have the measuring tape around the child's chest, note the level it's at (use another sticker if you need to), and then measure the vertical distance (#10) from the Side/Base of Neck to this chest level. Mine was 5". Now we are going to decide how low the armscye/armhole should be. I don't know about you, but most people don't enjoy having their armscyes cutting into their armpits. They like a bit of ease. I am going to suggest a value that I have found useful for children - 1" below the actual armpit is comfortable for them, even for a sloper. Some people like less, like 1/2". Without jumping ahead of myself to sleeve drafting, I will say that a smaller armscye generally fits better but it also means a tighter sleeve cap (and no, no cheating with puff sleeves). As you draft more, you will eventually find what works for you - that happy compromise between armscye depth and sleeve cap ease. For now, let's try 1" and you can decide, from your muslin, if you like it or not. So let's take that Chest-to-Side/Base-of-Neck measurement and add 1" to it. This is the same as saying you're letting your measuring tape droop 1" down. Mine is now 6". This is a measure of what is known as the Armscye Depth or Depth of Scye. 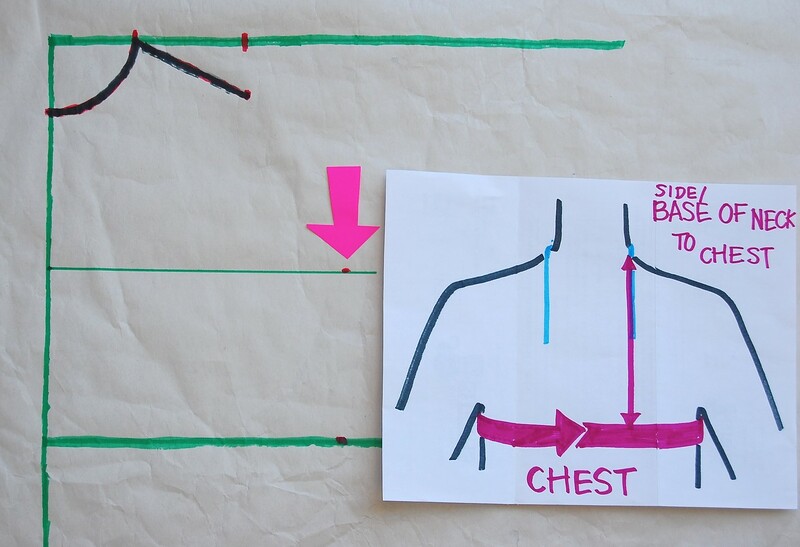 Draw a horizontal line at this level - this is the Chest Line we will be using. 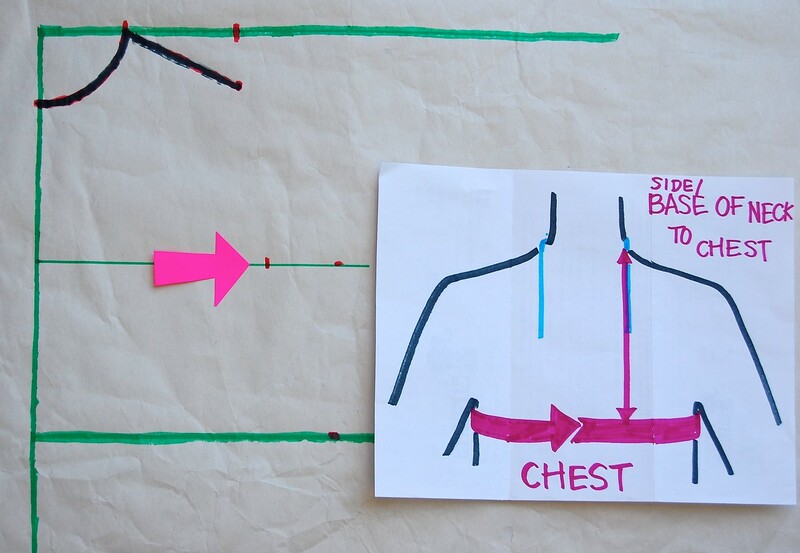 Measure the quarter chest measurement from the Center Front Line along this Chest Line and mark it (see pink arrow). Mine was therefore 5 7/8" from the Center Front Line, and 6" below the Shoulder Line. Q: Um, is this the Chest Line or the Armscye Depth Line or what? A: The chest is a very broad region vertically. The region immediately under the armpit is part of the chest. So is the area at the level of the bust (where present in older females). Unlike the waist, which is more concisely the narrowest part of the midriff of a person, the chest measurement can be taken at several points in the underarm area. For a child in particular who has no bust, the chest circumference immediately under the armpit (my 5" depth of scye with no ease) and the chest circumference 1 " lower down (my 6" depth of scye with ease) are the same. I can thus plot it at the new 6" level and still call it the "Chest" Line. We won't even draw in the 5" level since it serves no purpose. A totally optional check - if you need the extra reassurance - you can measure upwards from the Waist to the bottom of the armscye (#11) (i.e. from the Waist to 1" below the armpit). Check that against your draft as shown in the picture. Mine was 4.5". Whoa! That's enough time spent on the um.. armpit, I think. Let's move on to the waist now. We will return to draw the armscye curve later. (i) this were not a sloper but a pattern for a garment with considerable design ease, like an A-Line dress. (ii) this were for an older child without a protruding tummy. For the sake of completeness, let's assume this is a sloper for a young child with a protruding tummy (see very first photo of this post for example) whose front waist measurement is significantly larger than the back waist measurement. Or a pregnant woman! To obtain this, first imagine where the side seam of a well-fitting garment might be on either side of the child's body. This is ideally a perfectly vertical line beginning from the armpit and going downwards that divides the side of the body into the front half and the back half. Measure just the front of the waist (#12), from one (imaginary) side seam to the other. 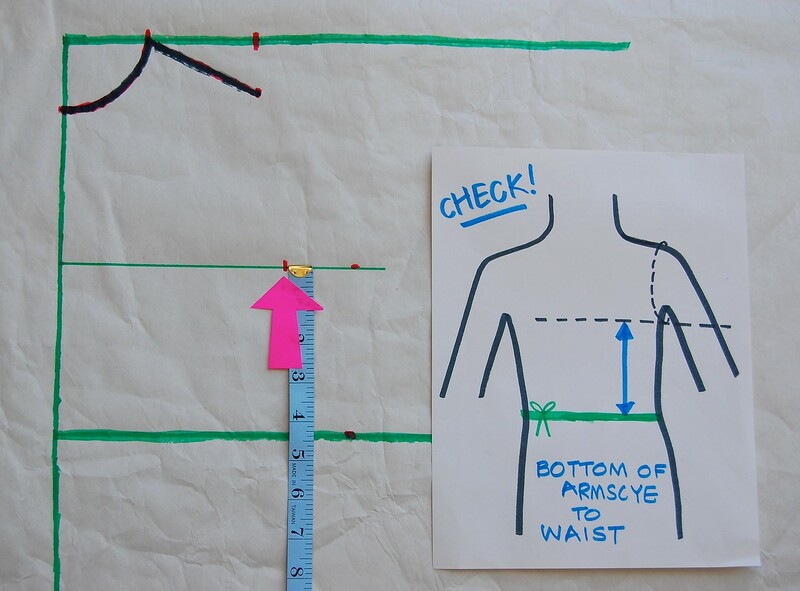 Have the child breathe in by pushing his/her tummy out as far as possible when you take the measurement - this incorporates sufficient fitting ease in the same way as with the armpit (ugh, there it is again) in Step 12. This measurement spans both sides of the body, so divide this by two to get the half value. My front waist measurement was 13" and the half value was 6.5". 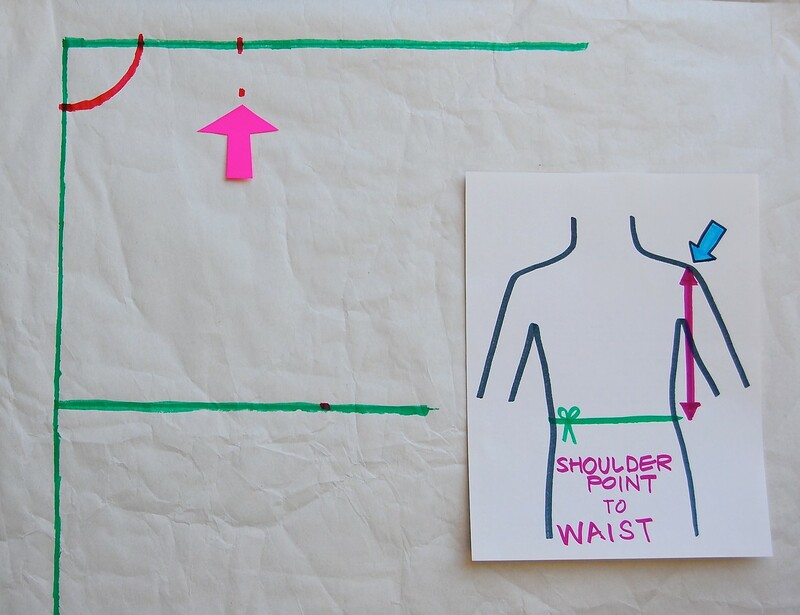 Draw the side seam from the Chest Line to the Waist Line, between the two points you marked in Steps 12 and 13. As an illustration of the importance of Step 13, measure the entire waist circumference with ease (#13) (i.e. with the child pushing his/her tummy fully out) and divide this by four. Mine was 21.5" and the quarter value was 5 1/8". Now, had we used this quarter value (mine being 5 1/8") instead of the Front-Only Waist (mine being 6.5") value in Step 13, the resulting sloper would have been too tight in the front and too loose in the back. The side seam of the muslin would have pulled to the front so that it is no longer vertical from the armpit downwards. See my charming-but-unflattering-drawing below that illustrates this unfortunate phenomenon in both the waist and hip area - ick. Oh, drafting deities, may this never happen to any of us. Ptoooi! Ptoooi! We're done with the upper body front sloper! If you were making a top that ended at the waist, you can stop here and eat chocolate to reward yourself. The next few steps will add the lower body front sloper to this upper body portion. On its own the lower body sloper will enable you to sew fitted skirts. Together with the upper portion, it will enable you to make entire dresses. Now we'll add in the hip measurement. Again, we'll be measuring the back and front separately. A: One word: buttocks. They make the back hip measurement quite different from the front. Need more convincing? See that unflattering sketch immediately above. 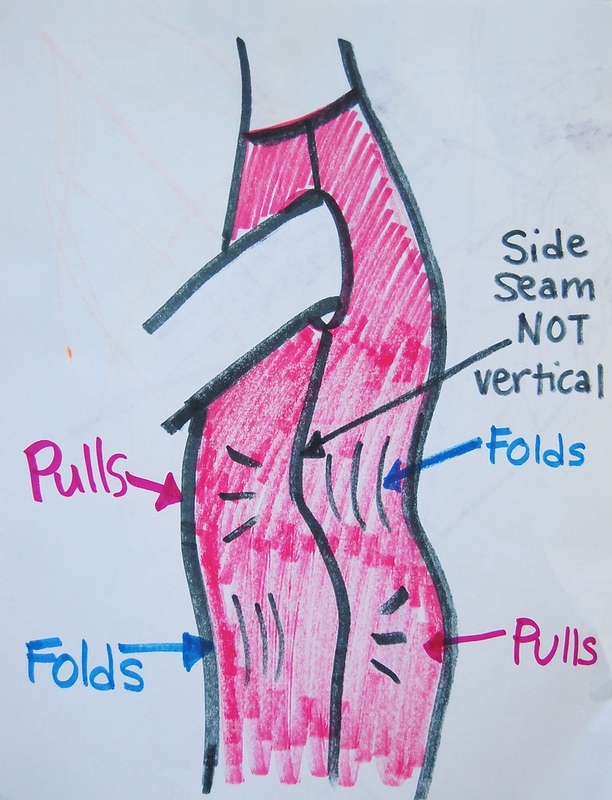 Again, imagine the vertical side seam line on each side of the child's body and measure just the front portion of the hip (#14), from one imaginary side seam to the other. Add a little fitting ease just as you did with the waist and chest. 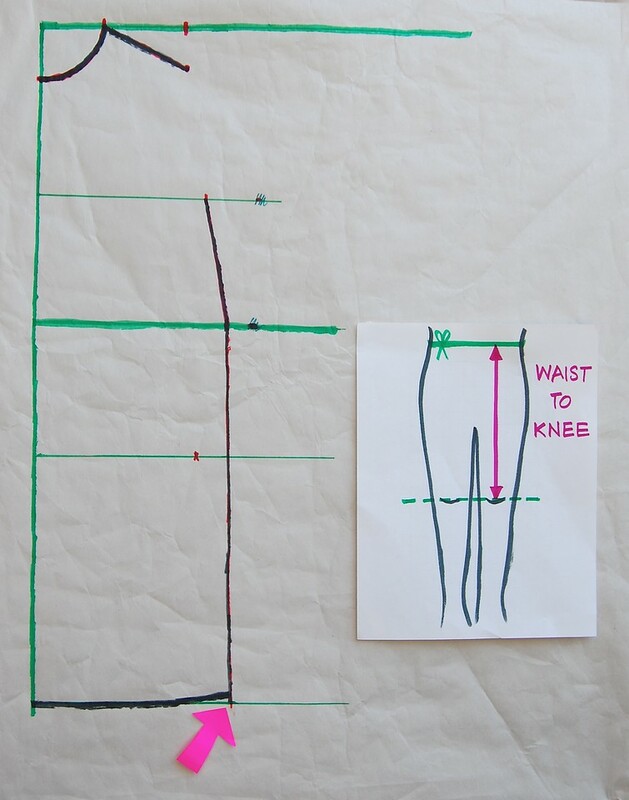 Obviously the hip does not expand when inhaling like the waist or chest, so instead have the child just wiggle his/her legs about, as if he/she is taking a step, and let your measuring tape loosen to include this movement ease. Divide this value by two to get the half value, just as you did with the front waist measurement in Step 13. This is the front Hip measurement. My front hip measurement was 11.25" and the half value was 5 5/8". Before removing the measuring tape, mentally note (or use a sticker) its horizontal level/position where you took the measurement in Step 15. Then measure the vertical distance (#16) between this and the Waist. This is the Hip Level distance. Mine was 4.5". 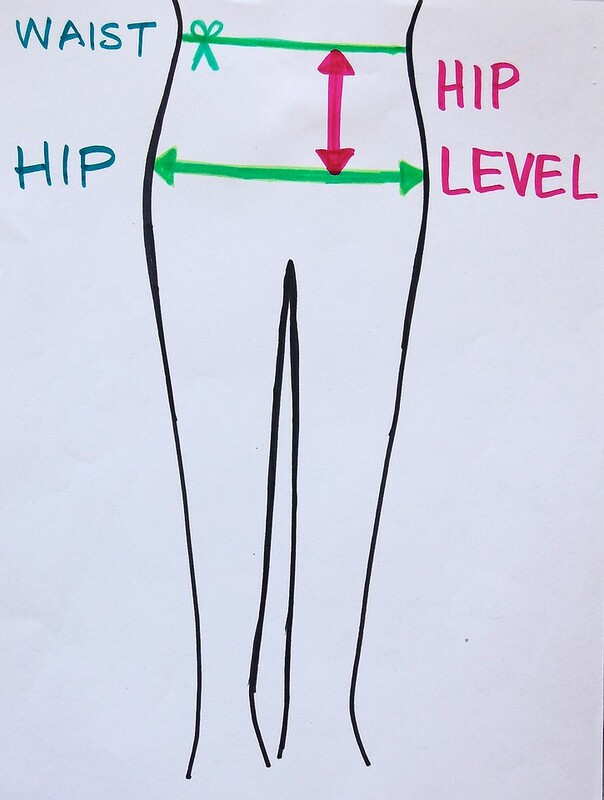 Now draw a horizontal line that is this Hip Level distance below the Waist. This is the Hip Line. 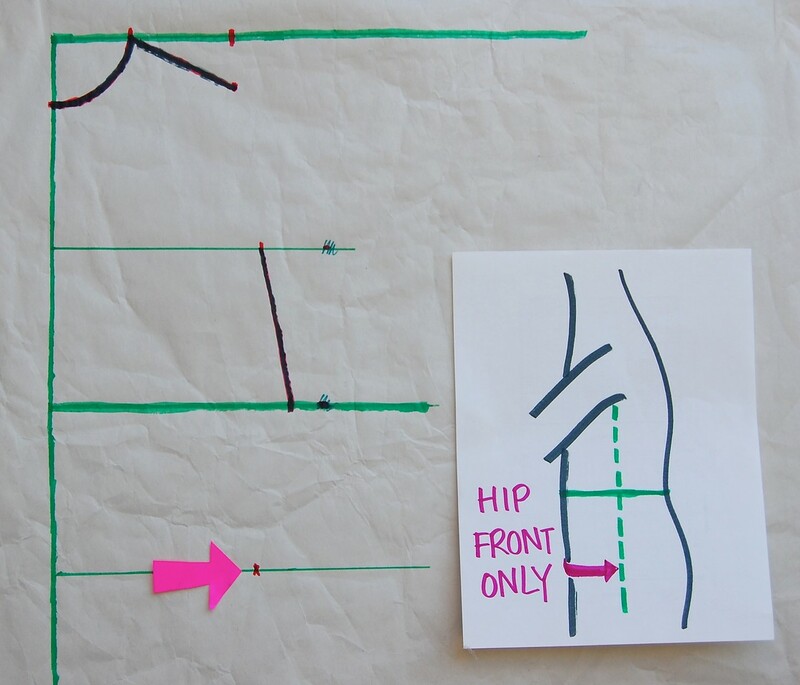 Mark a point along the Hip Line that is the half Front Hip Measurement from the Center Front Line. My point (pink arrow above) was 5 5/8" from the Center Front Line and 4.5" below the Waist Line. We are now going to draw the side seam line from the Waist to Hip. (i) an older child with a narrower waist and wider hips, or mature non-pregnant females. The hip is often the widest portion of their lower body. So their lower body slopers will have their hip measurement as its widest part. (ii) a young child with a protruding belly, or pregnant females. Their waist is often wider than their hips (at least in front). So their lower body slopers will have their waist measurement as its widest part. And we would drop a vertical line from that widest point to complete the sloper. 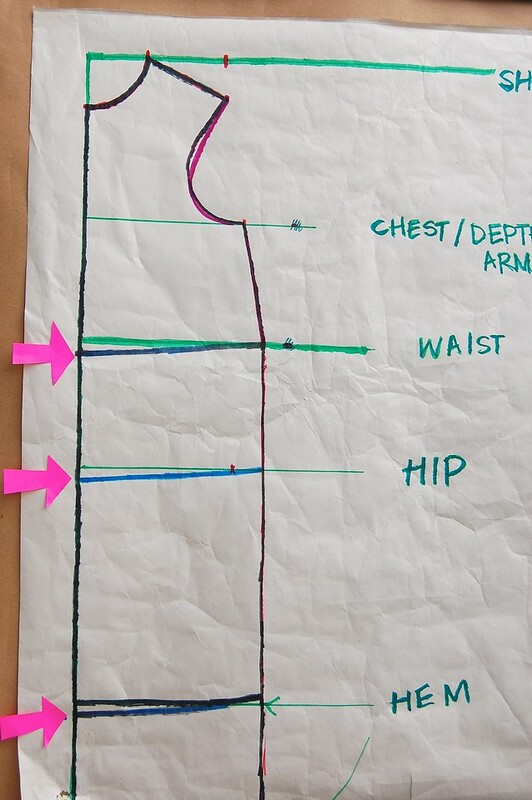 In the "With Tummy" case, this would be the Waist point W.
In the "No Tummy" case, this would be the Hip point H.
See the two pink arrows below - our draft has a wider front waist than front hip. So the waist measurement will be the widest part of the lower body sloper. 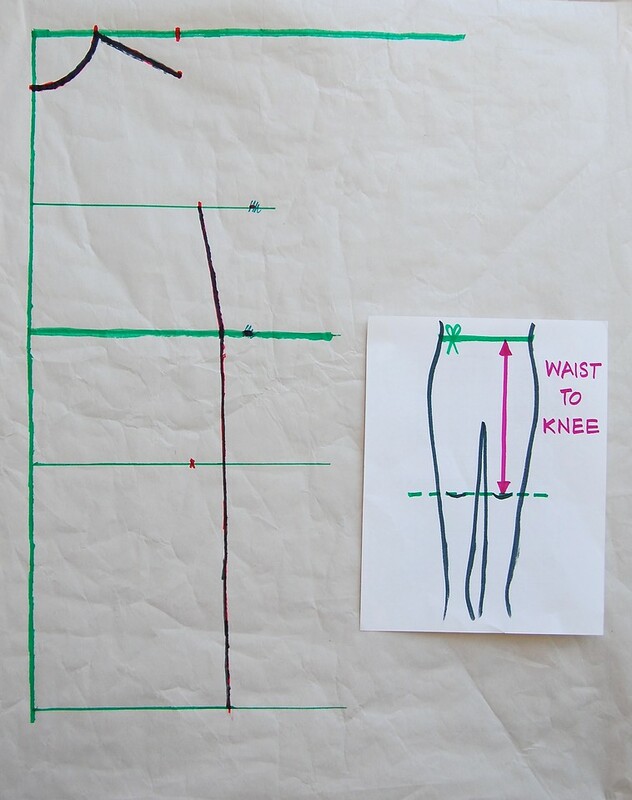 Draw a vertical line downwards from the Waist, ignoring the hip measurement. You're going to get a sloper that's roomy in the hip. That's good. We want to accommodate the tummy but not emphasize it by nipping it in with a fitting hip. Measure the vertical distance (#17) from the Waist to the Knee. 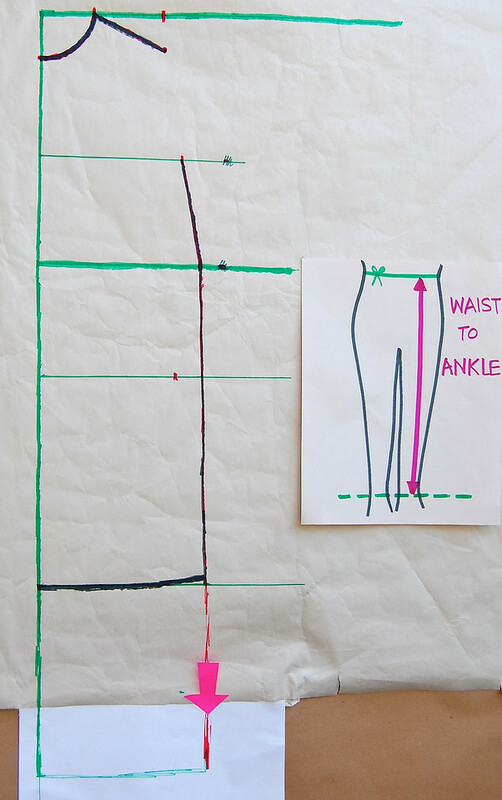 Draw a horizontal line on your draft, this distance below the Waist Line. This is the Hem Line. Mine was 13" below the Waist. Continue the vertical side seam line down to meet the Hem Line. 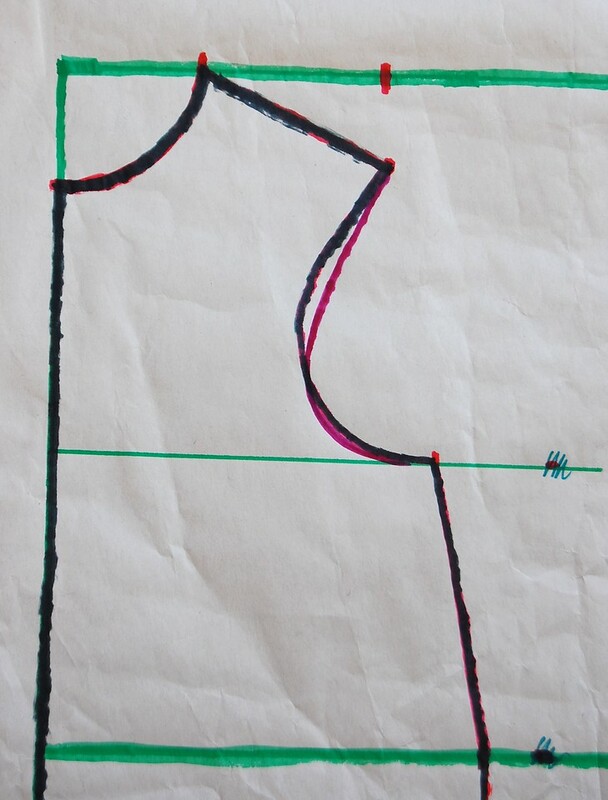 Curve the Hem Line up to meet the side seam line at a right angle (pink arrow below). Usually this is just a 1/2" rise. We do this so the front Hem will meet the back Hem in a smooth line and not a sharp point. If you were using this sloper to make long skirts or long dresses (such as costumes), you will need to extend the Hem Line to the child's ankle. 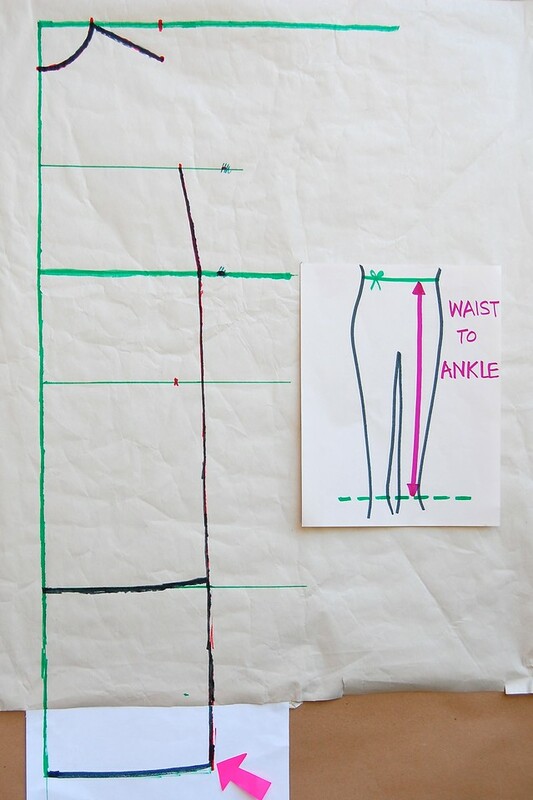 To do this, measure the vertical distance (#18) between the Waist and ankle bone (or wherever you want the hem to be). Draw a horizontal line on your draft this distance below the Waist Line. This is another (lower) Hem Line. Mine was 21" below the Waist. As with the higher Hem Line, continue the vertical side seam line to meet this Hem and curve it upwards slightly where they meet. Let's now return to the armscye to finish the sloper. This is arguably the trickiest part of a sloper or pattern to draw. I left it till the last so that I could spend a little more time on it. Many drafting resources suggest various formulae to draw this. 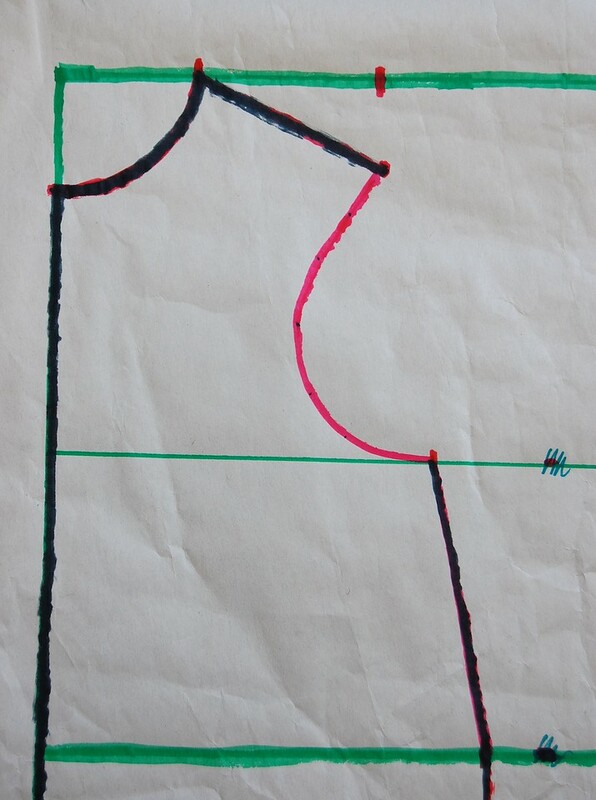 Some drafters take additional measurement points across the upper chest area to help plot the curvature of this scye. You are welcome to try any of these methods and find one that works best for you. I have always drawn this free-hand because it was how I was taught. But I'd also like to show you the rationale behind the shape of this curve. (i) The entire armscye (front+back) must fit the arm, with some movement ease. We added this ease in the form of 1" vertically below the armpit in Step 12. (ii) The sleeve cap (which you will learn to draft in later posts) must fit this armscye. Have your child raise his/her arm slightly away from the body so you have room to wrap the measuring tape vertically around her armpit, as shown in the sketch. 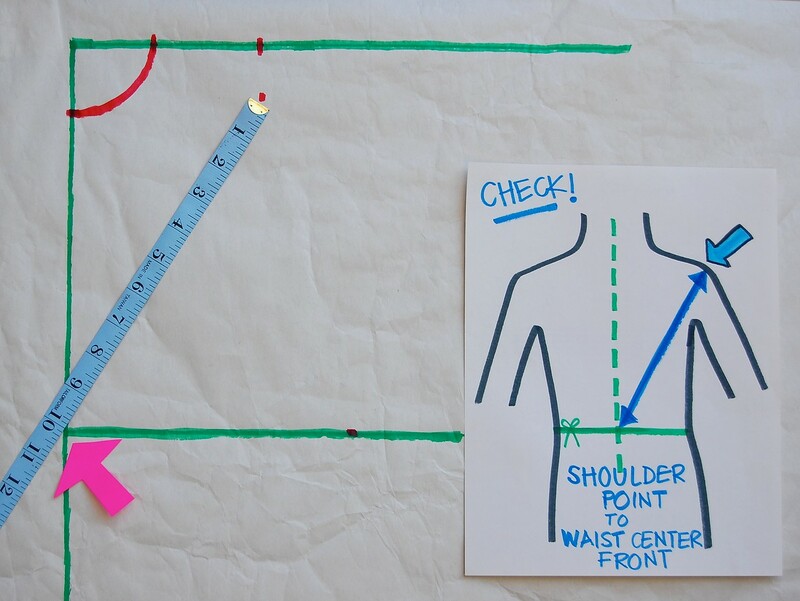 Ensure that the measuring tape passes over the Shoulder Point and droops to 1" below the bottom of the armpit. This is the total Armscye measurement + ease (#32). Divide this by two. We will use one half-value for the front armscye and the other for the back armscye (next post). Mine was 11.5", and the half value was 5.75". People move their arms a lot, and much more in the front of their bodies than their backs. So the front armscye is drawn deeper (more curved) than the back (more vertical) to allow for this movement. The half-value we got in the earlier paragraph will need to be modified a little to reflect this. (i) round up the half value to the nearest 1/4" for the front. This is the Front Armscye. Mine would therefore go from 5.75" to 6". (ii) round down the half value to the nearest 1/4" for the back. This is the Back Armscye. Mine would therefore go from 5.75" to 5.5". This is only a starting point, incidentally. There are times when I have rounded these values to the nearest 3/8" or 1/2", depending on the overall shape of the shoulder and chest and other variables. But let's move on, lest your eyes glaze over and you collapse. Most of you will not be comfortable drawing free-hand curves, especially when you are not yet familiar with general shapes of armscyes. So we'll use a flexible ruler (or a stiff, bendable piece of wire). Mark two points on this ruler or wire which are the same distance apart as the rounded-up front armscye in (i) above (mine was 6"). Bend the ruler or wire so that these two points coincide with the Shoulder Point and the Chest point as shown in the picture. Draw this curve - you will have drawn a Front Armscye. 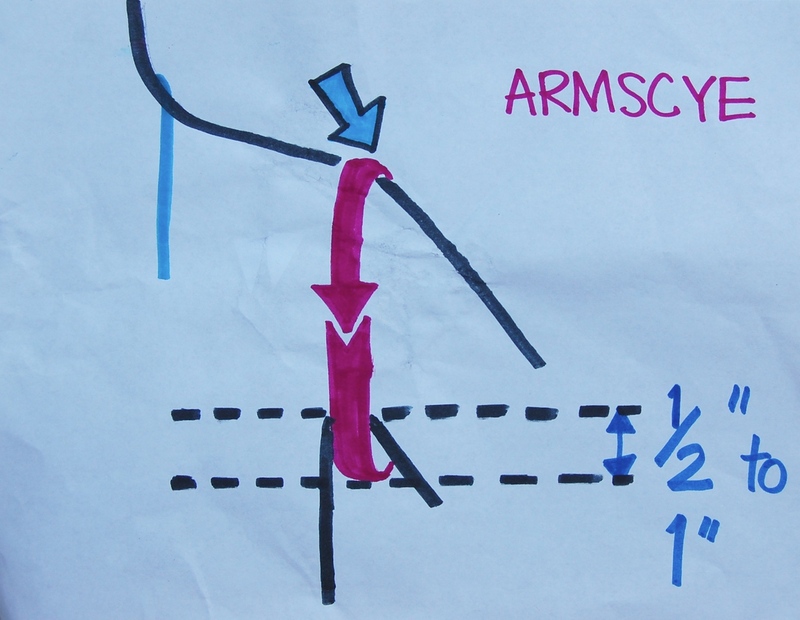 Here is a picture to show the shape of the armscye I might have drawn free-hand (in purple), in comparison with the one drawn with the flexible ruler (in black). Both curves are the same length. The shape is entirely a personal preference, but it is interesting to note that they intersect about two-thirds way down from the Shoulder Point. If you have read drafting books, you might recall this fraction (or one like it) as part of a suggested formula for drawing the armscye. This is an important point - it has an important relationship with the curve in the sleeve cap, which you will draft later. We are going to something now that is peculiar to patterns and slopers for young children- make Protruding Tummy Allowances. Those of you who have been pregnant might remember wearing regular but oversize dresses whose front hems rode up annoyingly because of the bulge of your belly. Maternity dresses and skirts compensate for this bulge by curving the hem down lower in the front. If your child has a round tummy, we will need to do the same thing. 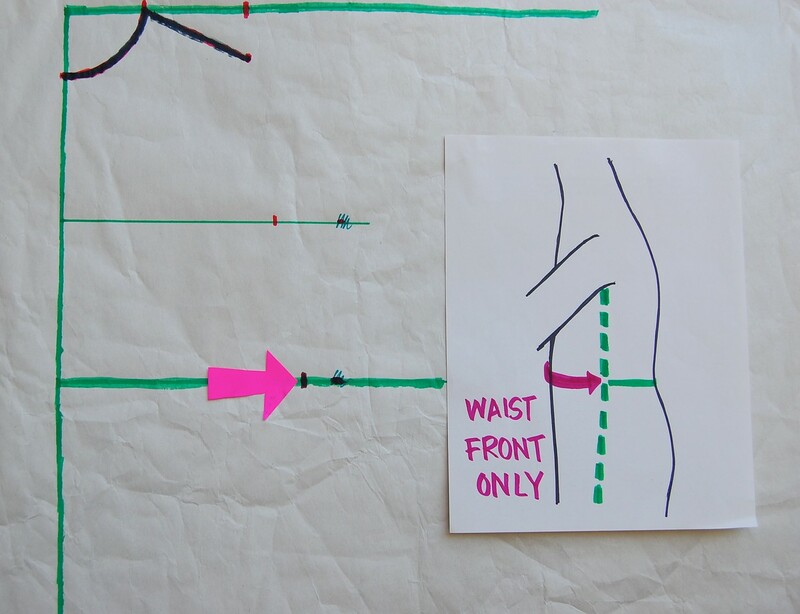 On your draft, drop the Waist Line, the Hip Line and the Hem Lines by 1/2" to 3/4" (depending on how protruding that tummy is), at the Center Front Line as shown by the three pink arrows. Gently curve the Waist, Hip and Hem Lines from the side seam down to these points. The blue lines are the adjusted Waist, Hip and Hem Lines. And one very last thing: a tiny refinement to the neckline. Well!!!! Are you still alive? Hello? Hello? We've finished the front sloper! Yes, we have! All that is left needed is to cut out the sloper along those sewing/center fold lines. There are no seam allowances - just the pure absolute-fit measurements. This makes it easier for adapting to patterns, or for adjusting commercial patterns to fit. Let's all sit down with a stiff drink. Like molten nutella. 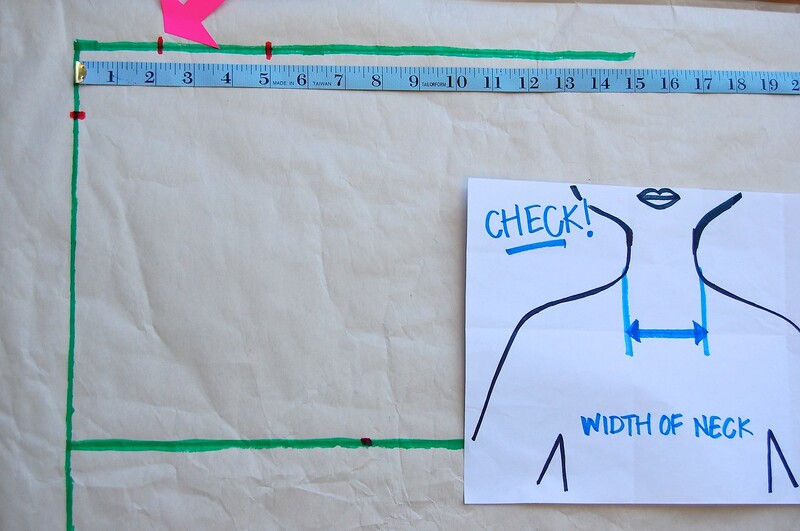 If you have been following along with the Measurement Table Worksheet, you might have noticed that I've ignored measurement #6 - Neck Circumference. We'll revisit it in another post - although it belongs right there in the sequence, we don't actually need it till much later. In the next post, we will draft the back sloper. It will probably go ten times faster because it is the same, with the exception of a back dart. When we are done with the back sloper, we will put both halves together and check for fit at the armscye and neck before declaring it finished and ready for its sleeves. Wow! What a lot of information! It all looks great and was easy to understand (even before 7 am). Thanks so much for taking the time to do this! Whoa ! Thank you, that is a great post. You just forgot one bit: how do you bribe them to stay still when you take the measurements ? (just kidding). Lorraine, I didn't get a chance to read through the whole tutorial, you are right,it's long. But I am coming back later today to thoroughly go through it and learn it. For the purposes of learning to draft, I guess I will measure myself, since my 2 year old is way too wiggly. AWESOME tutorial!!! As soon as my daughter is back in school, I am SO going to use your tutorial to start creating a sloper for her clothes. bless you for having the patience to do this. Wonderful job! Read it all and understood it all! Great stuff! I'm looking forward to learning the rest from you! I've started sewing clothes for the kids that are a little more complicated than a bag with elastic, but mostly the ones that work out are pure luck, rather than skill, so having someone show me how to set arms into stuff the way it's supposed to be done is priceless! Thank you! Fun to read! Waiting for the next one! Okay, my shoulder line is SO slopey it can't be correct! The shoulder point is below the hollow of neck point. 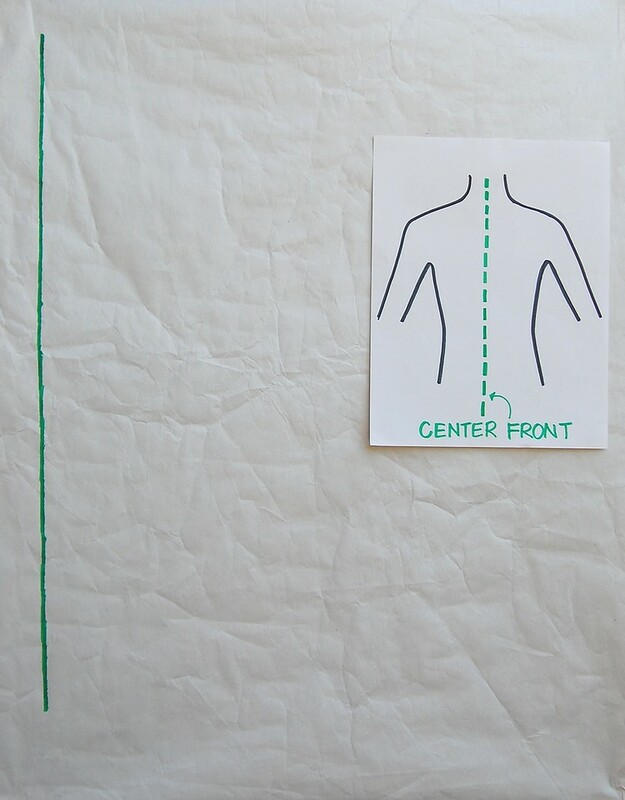 My question is, when you say to measure the vertical distance from the base of the neck to the waist, do you lay the tape over the curve of the shoulder to get to the base-of-neck point, or do you hold it straight up and down? Wonderful! Thank you so much for this series. I often sew without pattern and now I can really adjust this to my needs. I'm not quite sure. Does the sleeve as you also taught us automatically fit into this front sloper? Getting a really nice sleeve is always my big challenge. I'm finally getting around to drafting my first sloper. I'm so excited! Last time I got started (back when this was originally posted), my 4-year-old literally left in the middle of measuring to go be sick in the bathroom...it was the onset of a terrible flu for the whole family. This time went much better! Thanks for post this! !i'm trying to learn an it´s helping me a lot. Hi. I just found your post. I love it! I have been sewing for over 40 years and never knew how to "custom design" clothes. This tutorial is extremely informative and helpful. I plan to use it, for now, on some doll clothes which I am making. Not the same as a human, but at least I won't have to buy anymore patterns! Hopefully, some day, I will be making clothes for grandkids and I can use the tutorial for human clothing. Thank you very much! This is great! I recently spent ages puzzling through books about making and fitting sewing patterns. It was so annoying, this tutorial is WAY better! I Also love your writing voice! It's so friendly! Exclamation point! I'm trying to learn all of this, but I'm more math-minded and I have a habit of jumping on medium difficulty projects first. For about a week I've struggled and cross referenced several other books and sites. But your page/site has deciphered the geometric difficulty of pattern making for me. Besides explaining (visually) how the measurements line up, you've made several insightful points, especially how the diagonal measurements are done and what they mean. 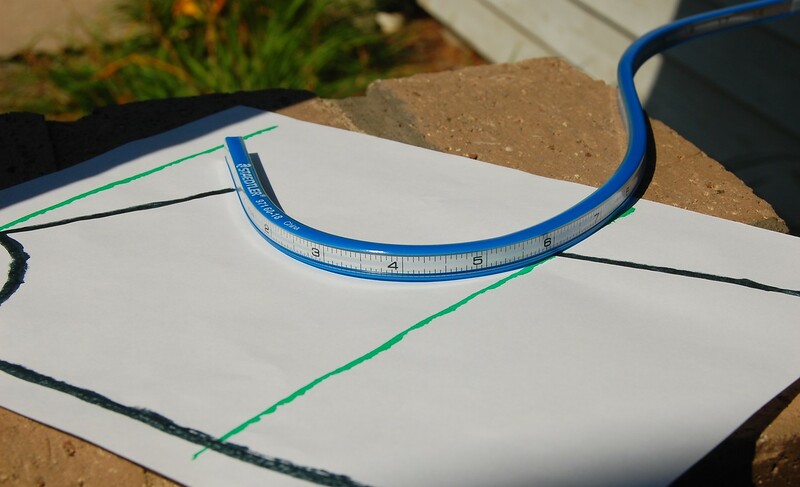 Also, the flexible ruler looks easier to use than a marked measuring curve, so I'm planning to find one ASAP. I appreciate the time you've put into your words and illustrations, as I'd probably be ruining lots of material without it. Do these same points of reference (measurement locations) go for women's sizes, too? I am a person who is short waisted (what waist?) and flat chested. I have not bought a blouse in years because I can't find any to fit. I rely on decorated T's. and sometimes you just have to have a blouse. Hi Anonymous, yes the same points of reference are used for women's sizes. 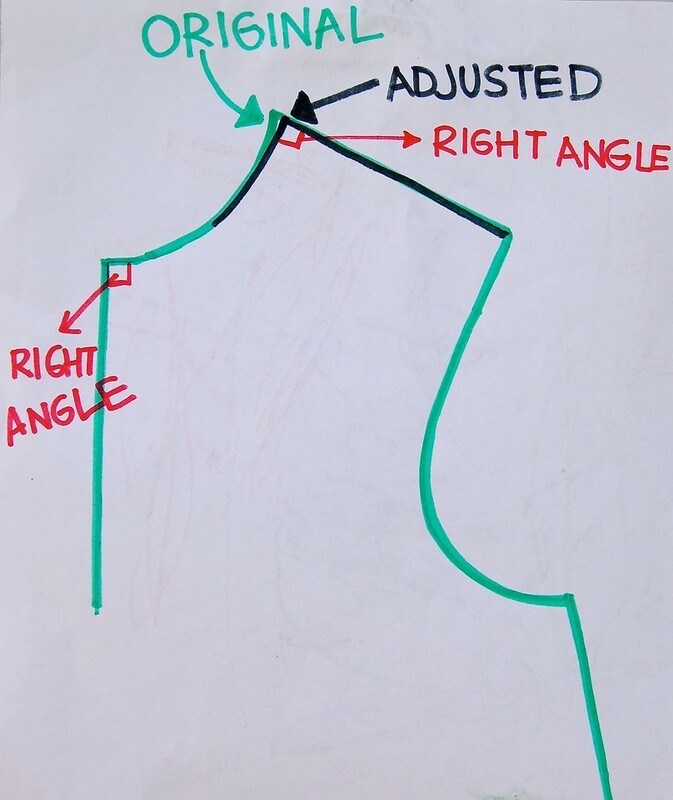 HOWEVER, there are quite a few more measurement points/areas needed for a woman's block, like bust, apex-to-apex, high bust, underbust, apex-to-shoulder point etc. So the short answer is that it is possible to draft a block for yourself without most of these additional points if, as you said, the bust measurements are not significantly different from the chest measurements. And if you are planning to make mostly loose garments. I have a quick question: Do you have this level of detailed tutorial(s) on Drafting for Women, especially if I look at taking 'self' measurement... Would appreciate if you can send me the link(s) for the same. My email ID is brieta@yahoo.com. I have used the vogue fitting shell pattern to make a basic set of slopers for womens sewing. This can then also be used to alter vogue patterns, and probably other patterns. Butterick also makes a fitting shell pattern that you can use to modify patterns or design your own. Vogue has shells for both dresses and pants. unfortunately no one seems to make one for kids so this blog is awesome. Hi, I loved your site.. I have been searching for someone to teach me how to draft and finally after few weeks I have found ur site..
What are the measurements used for a newborn? I want to titch clothes for my baby due in march and was thinking of making oneies/body suits for 0-3 months.. Do you have any pattern for that? I will have to guess the measurements? Hi, I had posted my comments earlier but dont know how it doesnt showup.. Let me tell you your site is very helpful and love it.. You have taken real pain to put everything together and it shows.. I actually have a question for you. Do you have any standard measurements for kids? I want to sew in advance for my baby due next year and thus I dont have her measurements. I want to do a nice dress with sleeves but since I dont have the measurements I am confused. Also I would like to see how to sew baby oneies.. Try googling, "sizing charts" or "measurement charts+children" or something similar to find charts of body measurements for multiple ages. After reading this about a year ago, I am finally about to have a go at drafting a block for each of my two girls. I'm not the neatest or most skilled sewer (I usually only sew costumes for them) but I've gotten tired of having to keep adjusting outfits because they don't fit, or they can't get them over their head. You're instructions are really clear and I am hopeful they will work out fine. Have you ever considered turning your drafting tutorials into a book? I think they would be a wonderful, and very popular book. Thank you for such an informative tutorial. I've been sewing for over 40 years but never knew how to sew without a pattern. I can alter well but I've wanted to know how to make it from scratch. You're very talented and I'm grateful that you've decided to share your talent with the rest of us. Thank you so much for creating such a brilliant tutorial series. I have been looking at the series for a while and been trying to work up the courage to have a go. I started today, measuring my 4yo girl. I got to step 10, and found that my diagonal check measurement is about an inch too long. I suspect I have done my measuring wrong and am going to have another go. I do have one question first. 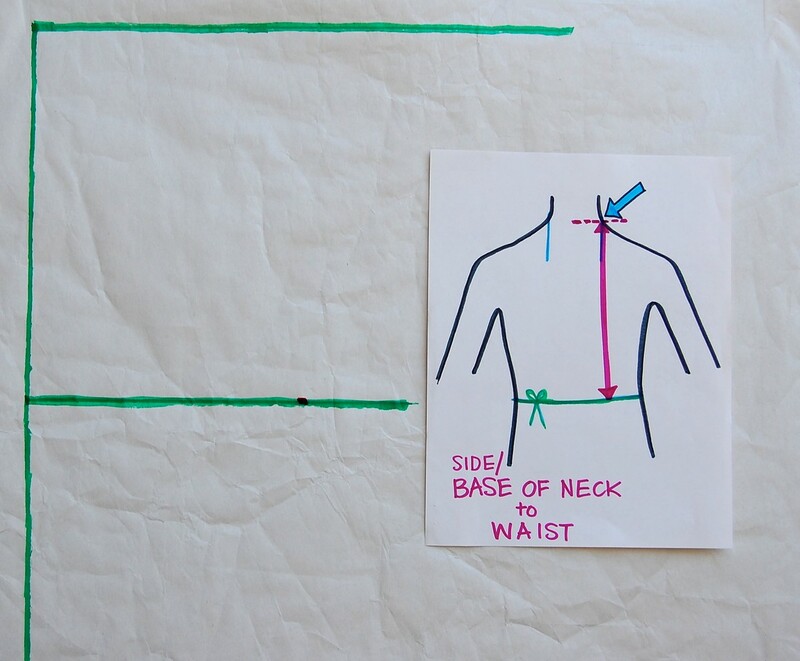 When you take measurements (say from side/base of neck to waist), do you place the tape measure on the base of neck mark and wrap snug against body to waist, or do you try to hold the measure straight and just measure the vertical distance without taking the body curve into account? I'm guessing that when you hold the measure against the body you get a slightly larger measurement. Katie, I am your cheerleader. Go, you! Okay, so your question: Yes, you would measure against the body, curved surfaces inclusive. Reason: this is how the fabric will lay when it is a garment. 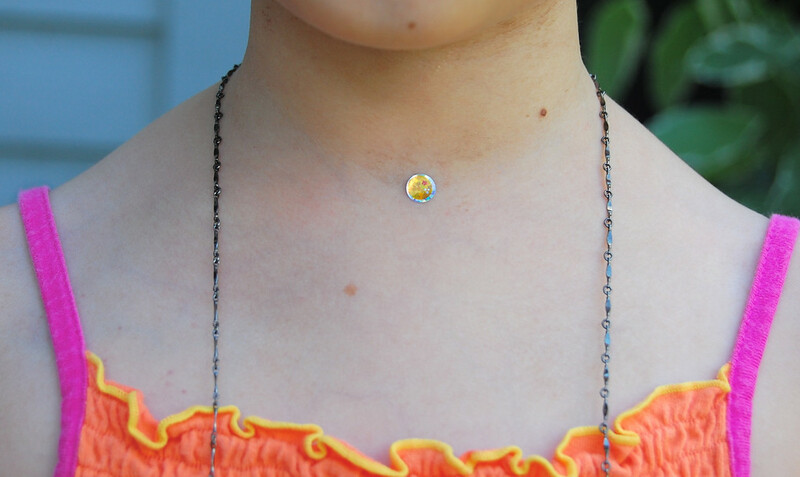 And in that particular measurement, it will curve over the collarbone to reach the base/side of neck. Thank you so much LiEr. I'm going to try again tomorrow and hopefully get it right this time. This time I'll do all the measurements with the tape measure against the body surfaces, and hopefully I'll get a better result. Thanks for the details in this post! It helps me to sort out why my body doesn't produce the sloper of the fictional woman that most tutorials are made for...! Especially the affirmation of not using 1/4 the circumference, but taking front and back measurements as well. Thanks so much. I really love your way of explaining things. If I could get my daughter to stand still for more than 4 seconds at a time, I might even be able to check, if I can put your explanations into practice.... :) Thank you again and again for taking so much time for this series! this was perfectly illustrated. you are excellent at explaining things. I think you could make money with a book deal! Wow, have been looking for a post like this for ages. I'm a bit over weight and it's ALL on my tummy so this has answered so many of my questions. Thank you. An awesome and complete, wordless qualificative , tutorial, I guess you must be one of those perfectionist persons that are admired for everybody as I do for you!!! thanks a lot! Hello. Thank you so much for all the awesome information. 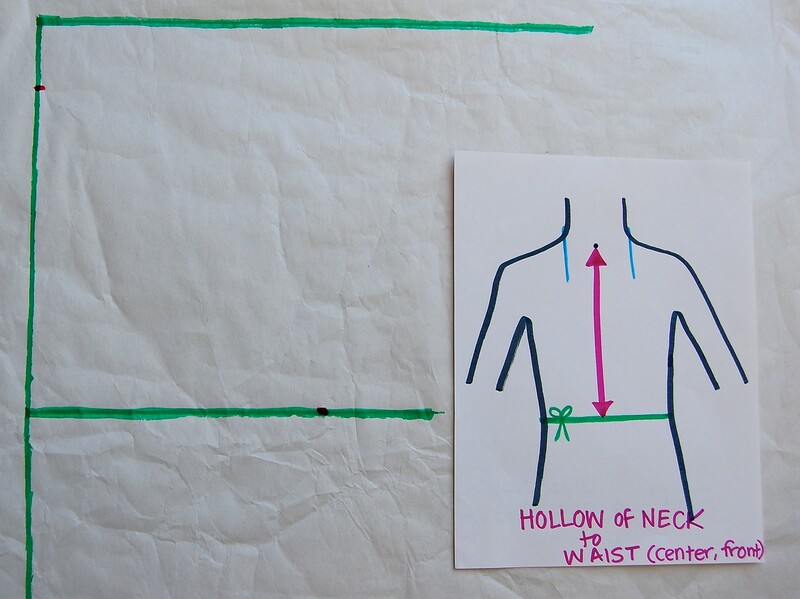 I have a question about measuring the hollow of the neck to waist: for an adult, do I measure between the breasts(not including them) or do I include them in this measurement? Anonymous: Both. Or, rather, you'd measure from the Side of Neck Point over the bust apex to the waist (let's call this A) , AND you'd measure the Hollow-of-Neck point to the waist, going between the breasts (let's call this B). And then you'd additionally measure the vertical distance between the Side-of-Neck point and the Hollow-of-Neck point and add that to B, and let's call that value C.
Then you'd subtract (A -C), which will give you a measurement of the vertical bulge (for want of a better word) of the bustline, which in turn will tell you how deep a side/french/armscye dart to make. I'm curious why you don't just use muslin to drape your sloper? That's what I have always done (although, I admit, not with very young children) and it's usually faster, at least for me. Mardee: do you mean why I use the drafting method rather than the draping method? Personal preference, I guess. And in some ways, making a sloper almost always involves some level of drafting anyway, when I refine the fit. Whew, pass over that Nutella! (Maybe topped with Ben & Jerry's ). I have several child patterns that are size 4+ but a 2yr daughter so I'm hoping this tutorial will go towards helping me adapt those cute patterns! That or by the time I'm done she will be 4 and problems solved. Har. wow!!! thank you vey much. easy to understand for the beginner like me!!!! Dear LiEr. Thanks for your amazing tutorial on drafting. I wonder if you could help me as I'm struggling with the shoulder slope/shoulder seam. 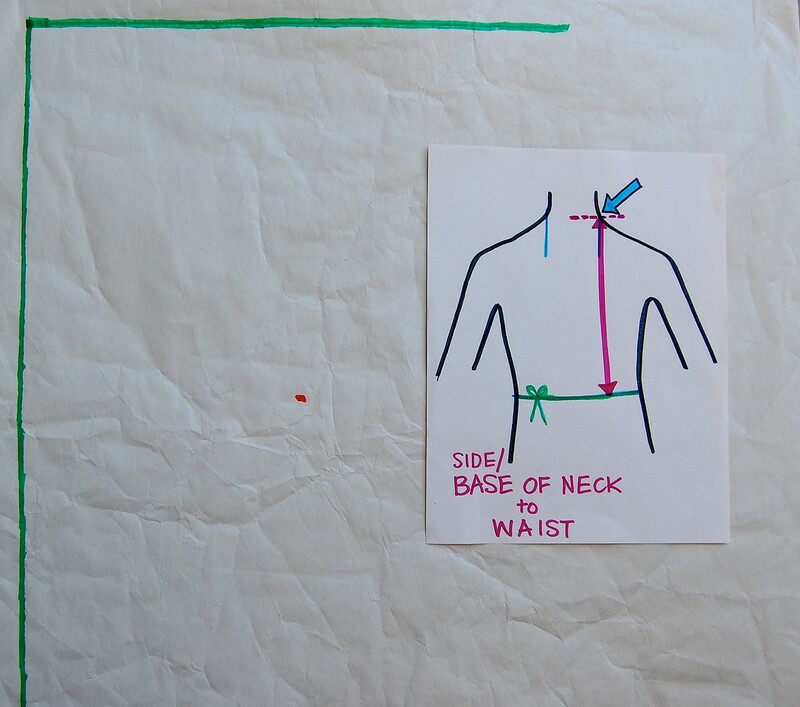 You ask in the Step 9 to measure Shoulder Point to Waist and then plot that distance directly under the mark on the Shoulder Line (No.3 measurement - Shoulder Point to Shoulder Point/2). Why is it directly under the mark on the Shoulder Line? 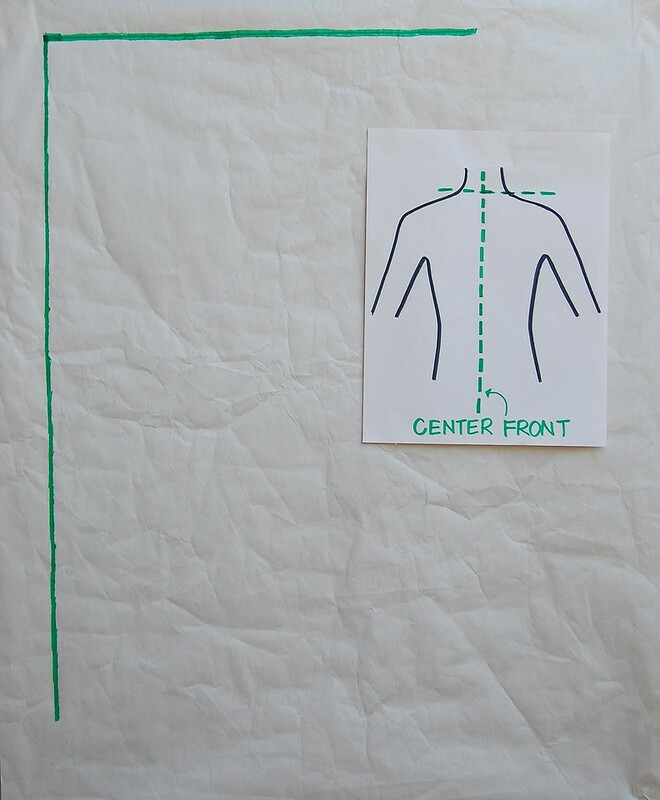 When I join Side/Base Neck and Shoulder Point my shoulder seam lengthens by 0.5 cm. (i'm practicing on a large 60cm doll). 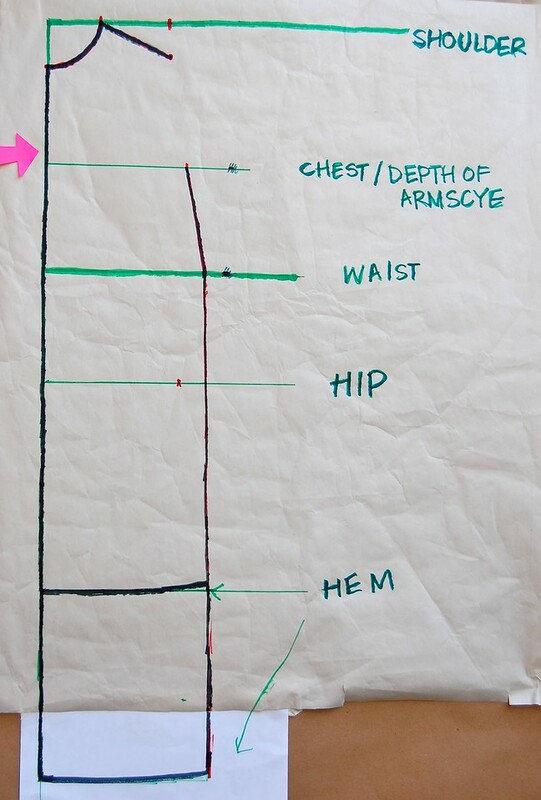 Shouldn't the seam be the same length as the measurement plotted on the Shoulder Line (Step 5)? Logically that's not possible when looking at the triangle formed by side/neck base, shoulder point and shoulder point plotted on the shoulder line. My Shoulder Point - CF measurement also does not match - it's 1.5 cm longer on the body when compared to the flat paper draft. I tried this on my daughter years ago but gave up as I did not know what I was doing wrong. I still don't know. :( Allow me just to say that I am immensely impressed by your talents and your generosity with which you share your knowledge. To begin, measuring the exact vertical position of the shoulder point is often an estimate at best, because of its two reference lines. In order to measure that vertical position, we can measure the shoulder point UPWARD from the waist (that's one of the reference lines) or DOWNWARD from an imaginary horizontal line that extends sideways from the base-of-neck point. 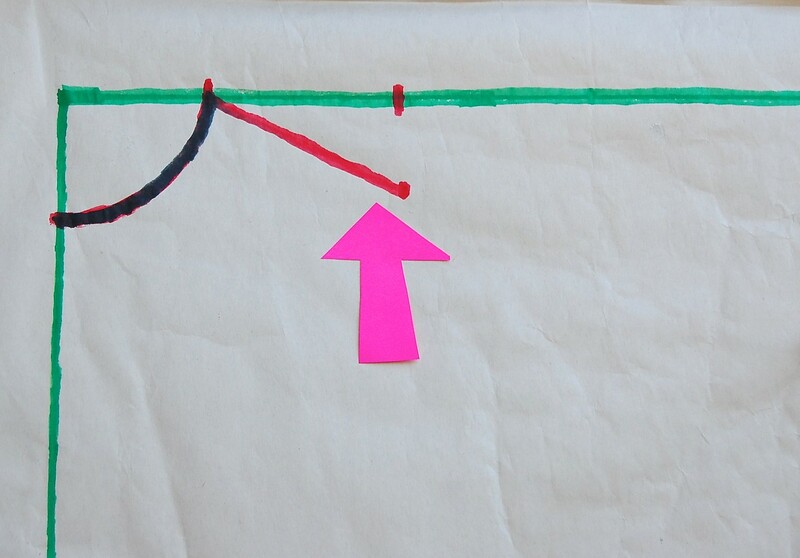 These are the two green horizontal lines that are present in Step onwards. Because the waistline is the more tangible of the two, I picked to measure UPWARD from that, and plot that position (vertical distance of the shoulder point from the waist) right under the mark of the HORIZONTAL shoulder width point. Think of every point on our sloper as having both a horizontal and vertical position, like plotting points on a graph in Math class. 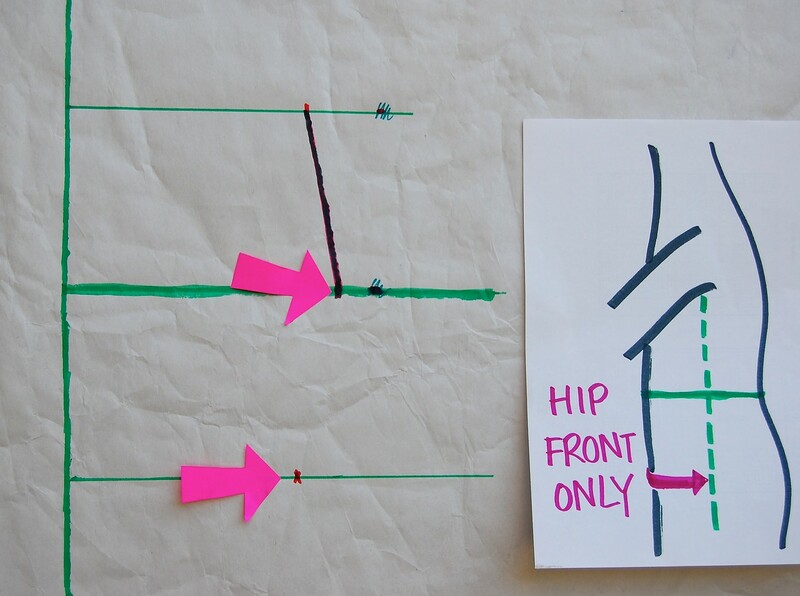 When you draw the actual shoulder seam line, it will be neither vertical nor horizontal but at an angle. Think of it as the hypotenuse of a triangle whose other two sides are the horizontal shoulder width distance (or half of it i.e. half of #3) and the vertical distance between the shoulder-point-to-waist-measurement i.e. (#1 subtract #7). This slanted shoulder slope width will never be the same as the horizontal shoulder width but the difference is often very small - usually 1/4" to 1/2". Measuring accurately to the millimeter (or fraction of an inch) on a human body and transferring that to paper is often very difficult - all it takes is for the person to fidget and the reference lines (even if tied with string or whatever) will shift. There have been times when I will measure each dimension two or three times and take the best (or even average) of them, and they might differ between as much as a 1/2". The vertical distances are often the hardest to gauge, especially distances measured to and from the waist, because it is notoriously hard to ascertain where the waist is. 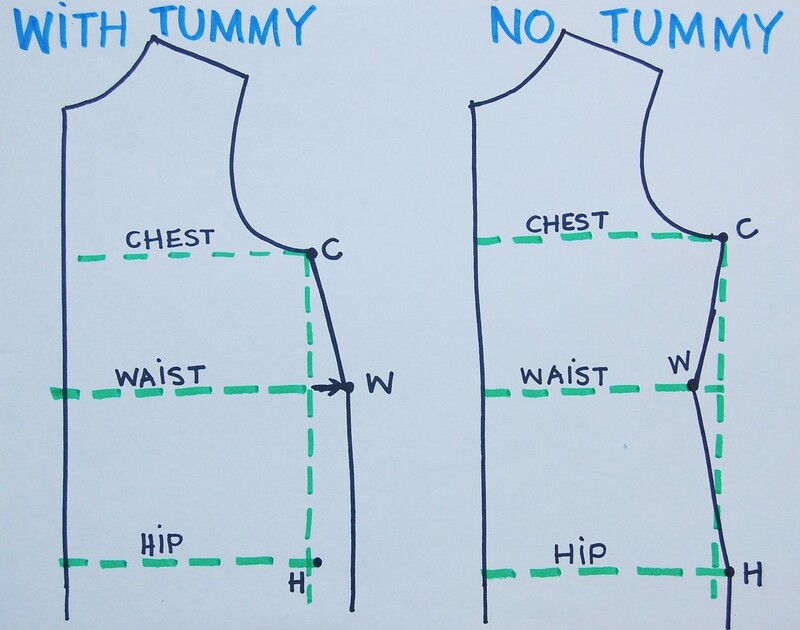 Sometimes you use the real waistline and sometimes, particularly if a model has a very short (or long) torso, you might compensate by "fixing" the waistline a little lower or higher than in reality. Without seeing the way you've measured across the chest of your model, I am unable to tell what might have gone wrong with the width measurements. It could be an issue of posture (which changes from minute to minute), or estimation of where the shoulder point actually lies around the rounded knob of bone, or even whether you stretched the tape across a fleshier part of the upper bust. My best advice is to take the measurements as best you can and then sew the muslin. Often you will not be able to detect errors in measurement until they are made into an actual garment, at which time you'll practically be able to self-correct the bits that were off. Good luck! Re: Taking Measurements On A Person. What I recently did is literally add lines onto the person! 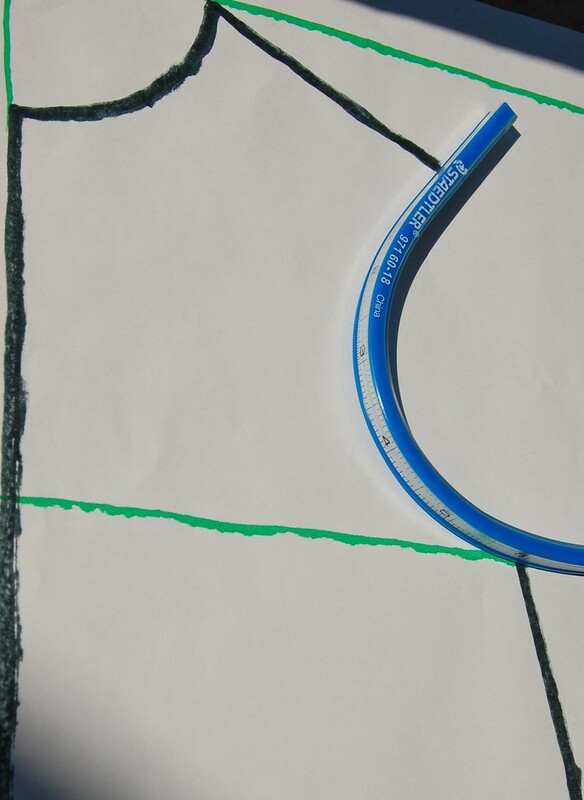 First I drew lines down the middle of lengths of masking tape. My girls put on tight-fitting t-shirts: this was a great cheater for establishing the shoulder, armscye & side through the use of existing seams. After putting a string around to find their waist, I then ran the marked tape around to keep it in position. All tape was then quickly set into positions. Measurements were taken & written right on the tape with a marker (Also, the ladies were able to mark with an X where their 'points' are, 'cos they both know their body & can see from their angle best!). The t-shirt armscye was a super guide for measuring as the wearer already knew what was comfortable for them & wore a shirt which doesn't dig into their armpit! I would love to send you pictures of this great experiment! Thanks for everything you have written...it was a gift for me & so I wanted to share this as a gift to you & others too. Petra, this is for woven fabrics. I keep coming back again and again to your blog because your information is priceless. Thank you so much for posting it.